There is a poetic beauty to the Apollo flights which lies in the fact that the crews navigated between worlds by sighting on the very same stars their ancestors would have employed to guide boats and ships across the oceans of Earth. The maritime connection even extended to the instrument used for the task, because the Apollo spacecraft had its own sophisticated version of the sextant, an optical device used for centuries by sailors to measure angles between stars, the Sun and Earth's horizon. Yet sighting on celestial objects was only one of a range of techniques that NASA brought to bear on the problem of guidance and navigation, skills that had to be mastered to ensure that 400,000 kilometres of space between Earth and the Moon were crossed in both directions accurately and safely. 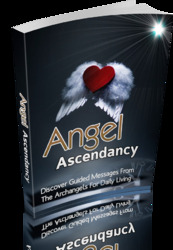 These skills required consummate finesse in the measurement of extremely subtle parameters, and mathematical competence to interpret the results correctly, as excessive errors were utterly and lethally unforgiving. This region of space, encompassed by the Moon's orbit around Earth, is termed cislunar space. Finding a way across it is therefore called cislunar navigation. Guidance and navigation underpinned much of the challenge of Apollo. Indeed, it is crucial to any form of spaceflight and, consequently, major systems on board the command module and lunar module were devoted to it, as were a large number of consoles in the mission operations control room (MOCR, pronounced to rhyme with 'poker'), particularly in the front row, known to its occupants as 'The Trench'. These were the flight dynamics guys and on a single shift, two flight controllers, GNC (guidance, navigation and control) for the command module and Control for the lunar module, kept a close watch on the hardware with which it was performed. A further three - the guidance officer (Guido), the flight dynamics officer (FIDO) and the retrofire officer (Retro) - thought about nothing other than where the spacecraft was, where it was going and how it could return to Earth if something went wrong, respectively. As this is a necessarily complex topic that is not always amenable to verbal description and requires a certain amount of three-dimensional visualisation, it is worth taking some time out to discuss the problem and consider how it might be solved. Guidance is how to make a spacecraft go where intended. Navigation is how to determine where a spacecraft is. Control is operating the hardware to ensure that a spacecraft reaches its intended destination. Contrary to misconceptions raised by the entertainment industry, spacecraft do not fly around the cosmos with their engines ablaze. Instead, everything in space, be it spacecraft, our Earth or the entire galaxy, generally coasts along following ballistic paths, moving in free-fall with their motion determined by gravity. A major step towards guiding a spacecraft is to understand how those paths work, and how they might be measured, predicted and then controlled. Apollo's initial ellipse becomes a flight path to the Moon. the Moon by the S-IVB stage on an extended, curved trajectory away from Earth, governed by the same natural laws that took the stone along its ballistic arc; one that, without outside intervention, would reach a slow peak before falling back to Earth. The trick for lunar flight was to work out the time and duration of the S-IVB's throw that would cause the Moon's gravity to intervene on the spacecraft's path in a beneficial manner. By careful calculation, NASA's trajectory experts picked the correct place and time, and just the right amount of shove from the S-IVB's engine, to set up a rendezvous between the spacecraft and the Moon. For the three days in which Apollo coasted on its extended ellipse out from Earth, the Moon moved a quarter of a million kilometres along its own orbit (about a tenth of a complete revolution). Had the technology of spaceflight produced some fabulous ship with unlimited propellant, the trip could have been made much more quickly by having the crew fire their engines all the way there and back, using brute force to expedite the journey. Unfortunately, no space faring nation has yet had that luxury. Lifting propellant off Earth's surface and into space is an extremely expensive proposition. Having paid dearly to get it there, it must be used in the most efficient manner possible to avoid carrying any more propellant than is needed for the task. It was this type of thinking that allowed the Apollo missions to be accomplished with a single Saturn V in the first place. Flying through space using chemical rockets has always meant short engine burns that modify long coasting flights. Diagram of a stone and football thought experiment more slowly, the football would fly across its path early, leaving the stone to coast past the ball's trailing side. If the stone had been moving a little faster, it would reach the football's flight path before the football arrived, and would therefore pass in front of it. 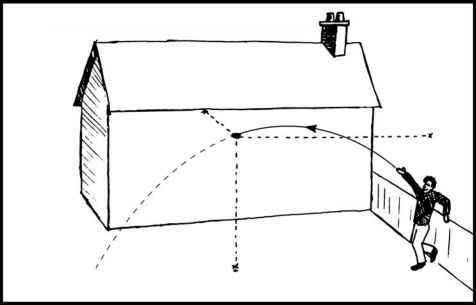 Finally, if there was a way to control the timing and force of the throw accurately, and then to study the stone's flight path very carefully and change it if required, the stone could be made to pass the leading side of the football by any number of millimetres we wished. Getting an Apollo spacecraft to the Moon was a very similar exercise except that a football has no appreciable gravity and the Moon does, and this had to be taken into account. 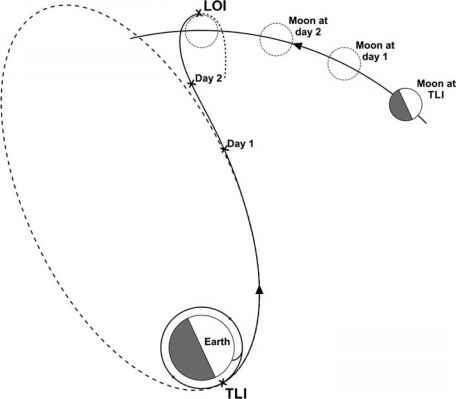 If the trajectory inherited from the TLI burn was correct, the spacecraft would miss the Moon by about 100 kilometres, but it would be pulled around the lunar far side and slung in the direction of Earth in an approximation of the intrinsically safe free-return trajectory. This was when the spacecraft was to intervene by firing its SPS engine. It was fired near the point of closest approach to slow the spacecraft and have it enter lunar orbit. But what would have happened if the Moon-bound trajectory had not been precisely right? If the spacecraft were moving towards the Moon too quickly, it would have reached the Moon's distance too early and have flown over the surface at a higher altitude. A failure of the SPS engine to slow the spacecraft down for lunar orbit would have allowed it and its crew to sail on into deep space, never to return, at least not alive. At the other end of the error scale, an ever-so-slightly slow coast would have reduced their miss distance with the Moon, creating a very real risk of the spacecraft impacting the lunar surface as it swung around the far side. It was obviously critical to the lives of the crew that the spacecraft be placed onto the ideal Moon-bound trajectory. It was equally important to determine whether or not that trajectory was being followed. One of the inherent problems in ballistic flight is that tiny perturbations early in a trajectory have large effects when followed forward to its destination. Even an apparently perfect trajectory from the TLI burn contained errors initially too small to measure, but whose effects became apparent through time. 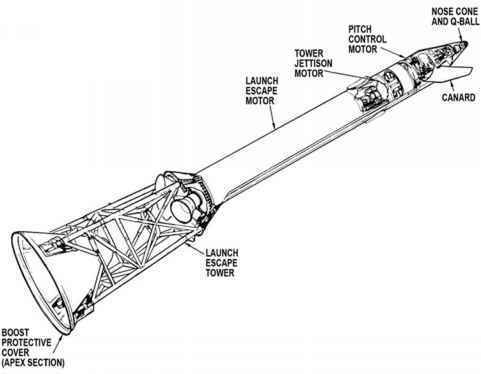 Additionally, ground controllers had to understand the many factors that could interfere with Apollo's trajectory, the most significant of which was the size and direction of the push given to the spacecraft by the S-IVB at translunar injection. Despite being well-engineered and controlled, this rocket stage, like any rocket in existence, was unlikely to deliver a perfect burn. There was always some small deviation from the ideal that would later have to be compensated for. Additionally, as the spacecraft coasted to its destination, housekeeping manoeuvres carried out by the crew using the RCS thrusters tended to cause tiny changes to the trajectory. Also, the expulsion of any liquids or gases by the crew as part of their daily operation generated tiny thrust forces. Water vapour from the spacecraft's cooling system, waste water from the fuel cells as they generated electricity, and urine from the crew were all necessary emissions that generated sufficient thrust to perturb their trajectory. To compensate for all these compounded perturbations, the crew had to make small correction burns. However, they had to know how much correction to make, and to do this it was necessary to measure their trajectory with extreme accuracy. The state vector of a thrown stone. How do you navigate a spacecraft to the moon?